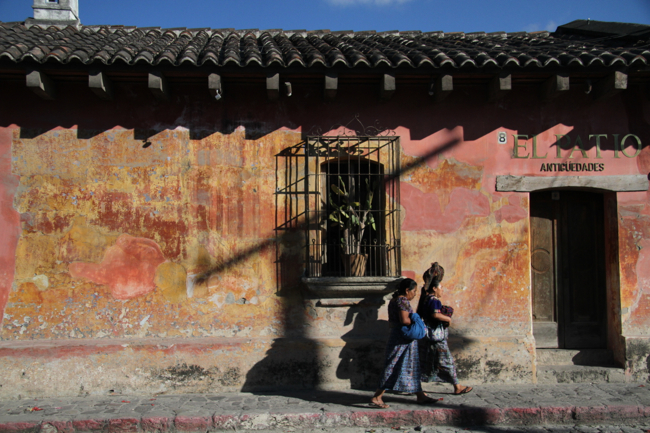 Our last destination in Guatemala was the charming colonial town of Antigua. With the ominous Volcan Agua serving as a striking backdrop, Antigua feels like a modern-day Pompeii, enjoying an elevated level of prosperity before the eruption. Volcan Agua dominates the skyline of Antigua. Antigua offers a multitude of excuses to relax and take it easy. Cozy cafes and cute restaurants tucked into hidden courtyards beckon the passing traveler. With its cobblestone streets, colorful buildings and an abundance of once-glorious churches in various states of ruin and decay, Antigua offers a variety of subjects for the photographer. We spent two days leisurely strolling the streets of Antigua taking in its faded charm and trying to capture some of it with the camera by day; by night, we brushed up on our salsa moves with group lessons at $3/hour, sampled the international cuisine on offer, and caught some live Cuban-inflected music at a ritzy restaurant. Colorful churches add to Antigua’s charm. This arch was originally built so nuns could cross above the street without being seen. 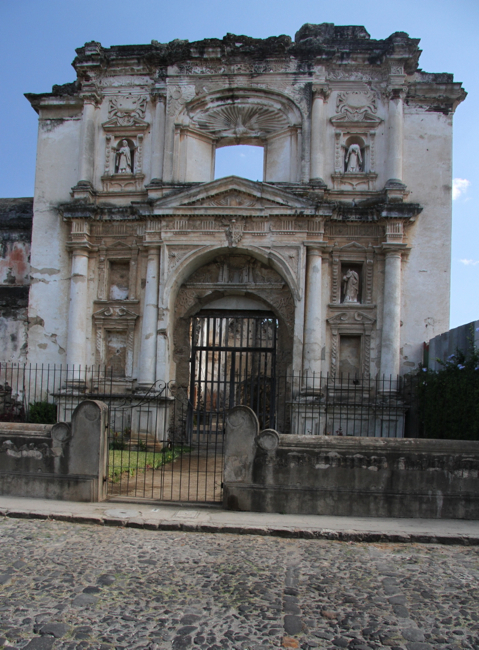 Churches in various states of decay are everywhere in Antigua. 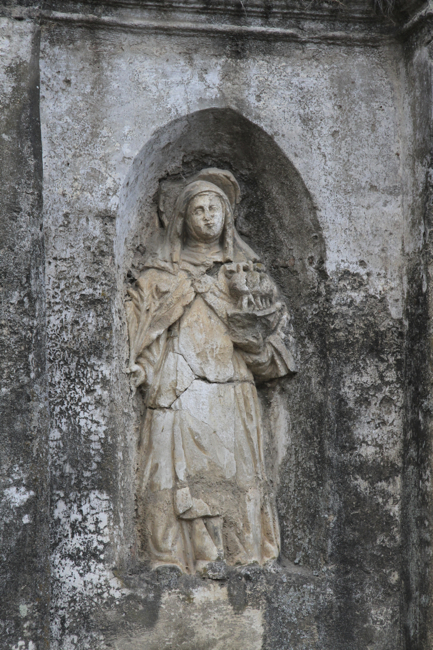 Statues like these attest to the former glory of the city. 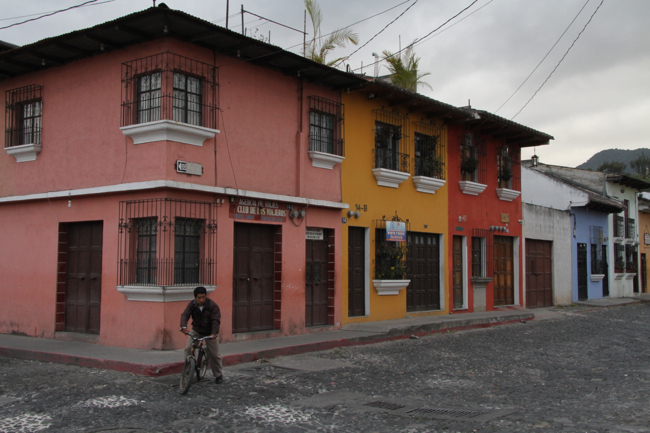 Houses and buildings are painted in a riot of colors. 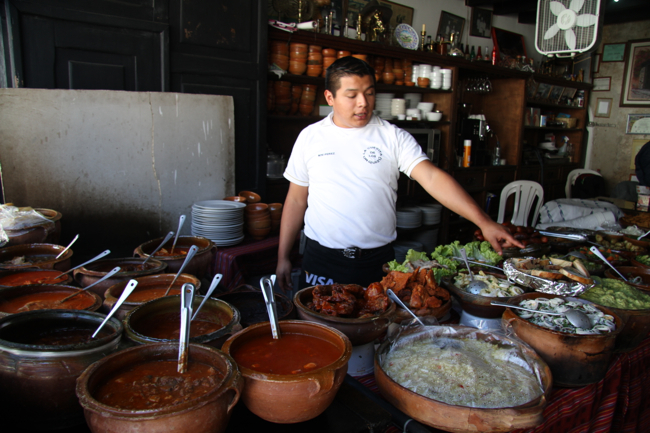 Local dishes can be sampled at Cuevita de las Urquizas, a restaurant specializing in platos tipicos. 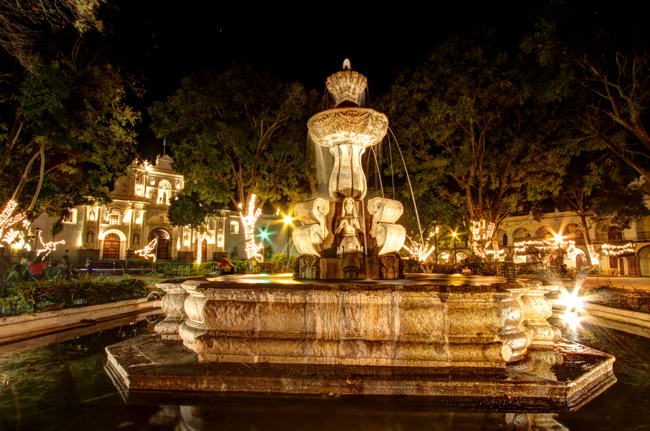 This beautiful fountain is the focal point of the main square. 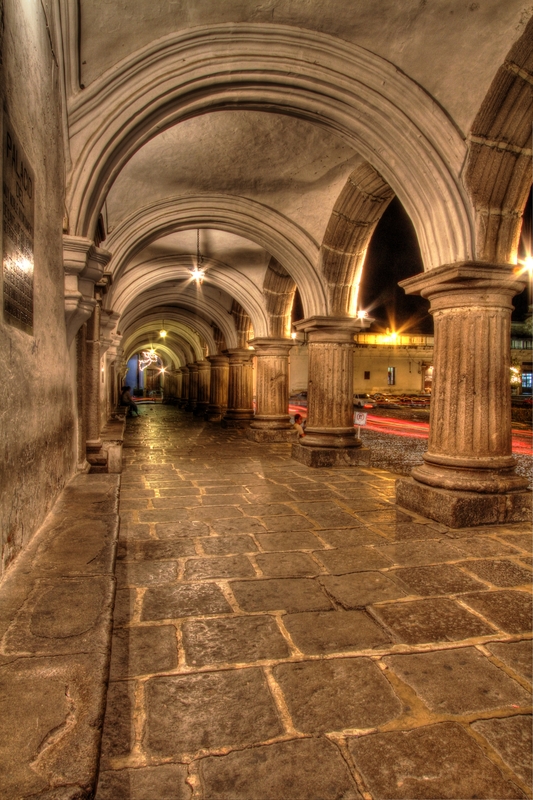 A charming colonnade lines the main plaza. 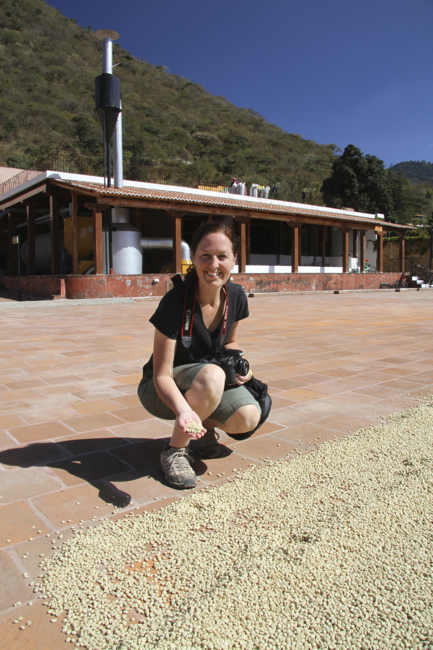 We were especially interested in touring a coffee plantation, as Antigua is one of Guatemala’s best-known coffee-producing regions. 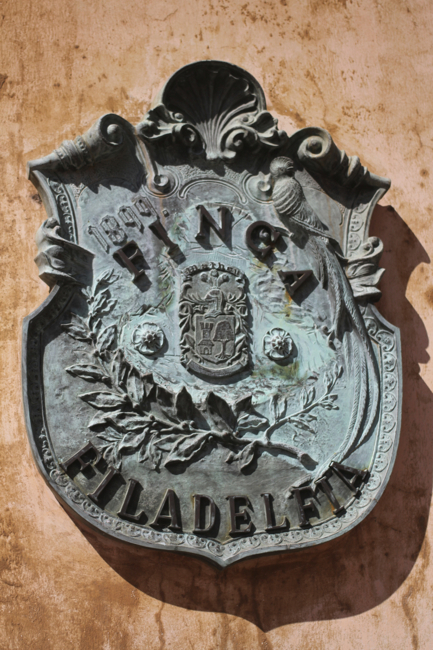 Finca Filadelfia, located on the outskirts of town, has been producing high quality coffee beans for four generations. Finca Filadelfia picked us up in town in an open-air truck and took us on a coffee safari, driving around the plantation and explaining the horticulture of coffee. 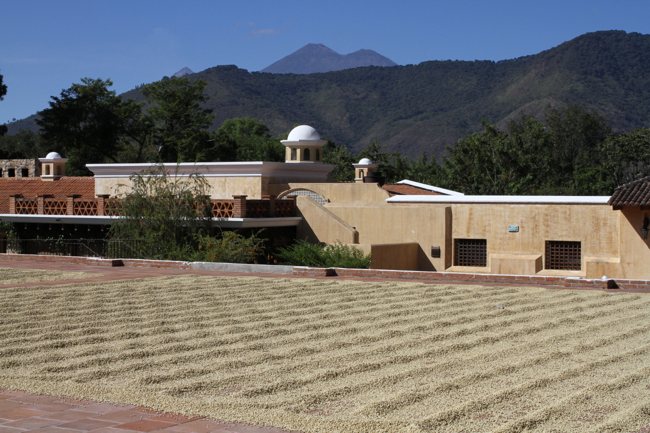 Finca Filadelfia is an elegant coffee estate located just outside of Antigua. 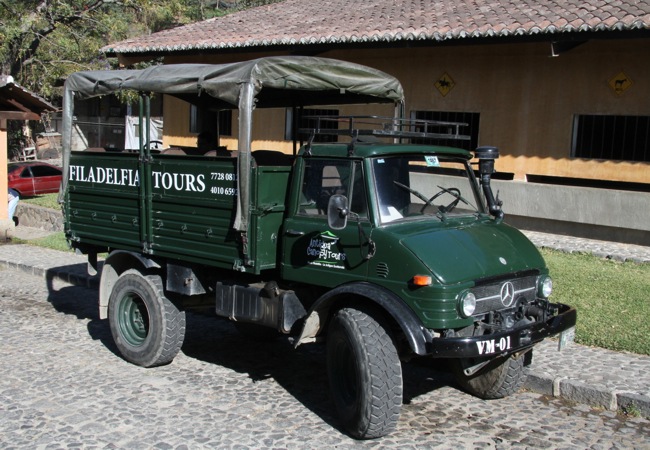 Open-air trucks add to the safari-like feel of the tour. 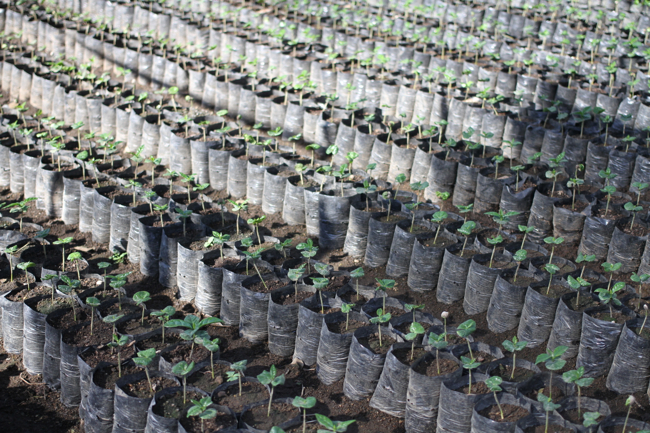 Single seeds are cultivated in a nursery for a year before being planted on the estate. 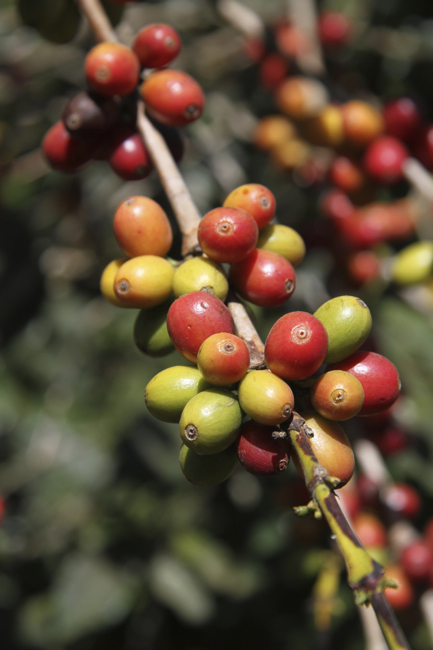 Coffee berries are hand-picked when they turn cherry red. We then toured the facility where the coffee bean is separated from its fruit, fermented, dried, roasted and finally packaged for sale. 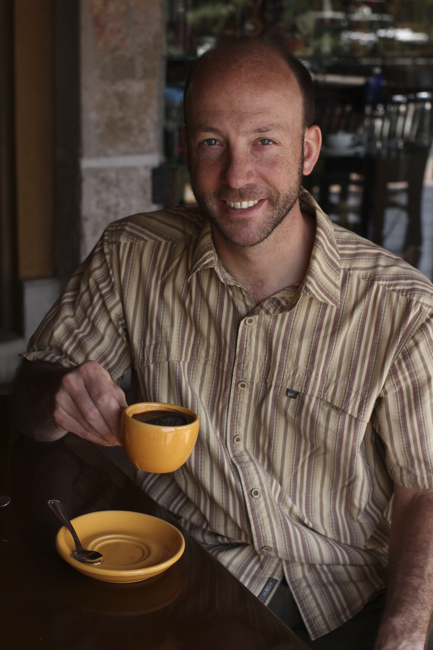 It was fascinating to see how much care and attention is given to producing an excellent cup of coffee. The tour ended with an opportunity to enjoy the final product, and it was well worth the wait. 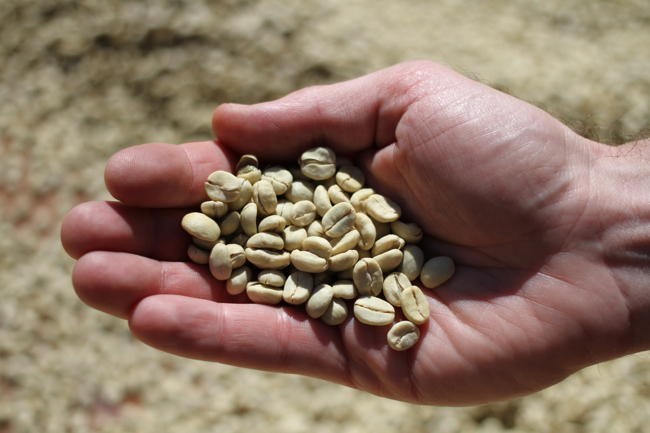 Coffee beans are dried in the sun. These beans still need to be shelled and sorted before roasting. 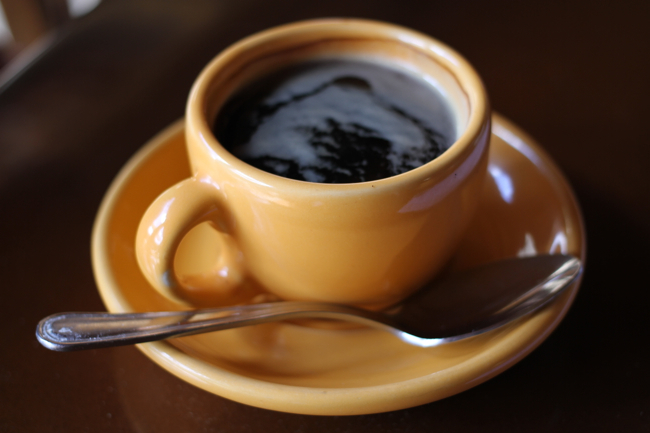 So much work goes into a single cup of coffee. But for some, it’s the best part of waking up! People often say that nobody ever visits Guatemala just once. With its stunning and varied geography, impressive Mayan temples and friendly people, there are many reasons to return . . .
Travel Logistics: We traveled to Antigua from San Pedro de la Laguna on Lago de Atitlán. This involved catching a 30-minute ferry across the lake from San Pedro to Panajachel on a small passenger boat and then a two-hour tourist shuttle to Antigua. 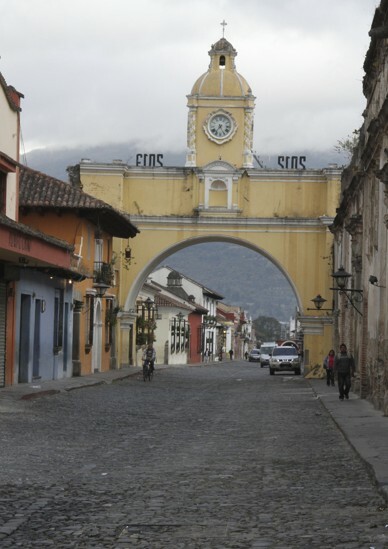 Antigua was our final destination in Guatemala. 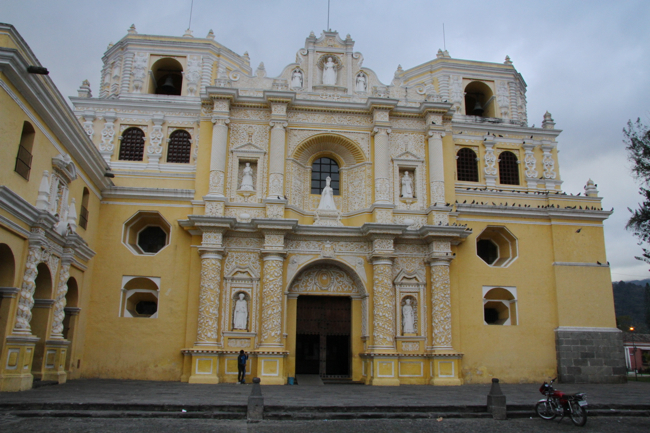 We were able to catch a convenient tourist shuttle directly to the international airport in Guatemala City from there. P.S. Coming home after a great trip like this one is always a drag, and we can’t help but get a little depressed when we arrive back in Chicago. The one thing that always manages to cheer us up, though, is our amazing cat Moose. No matter how long we have been gone, he always finds it in his heart to forgive us, and he really is an unusually cool cat. Don’t believe us? Just check out his preferred method of grooming, and you will see what we mean. Enjoy! Thanks, Leah. Your kind words brings a smile to our faces! 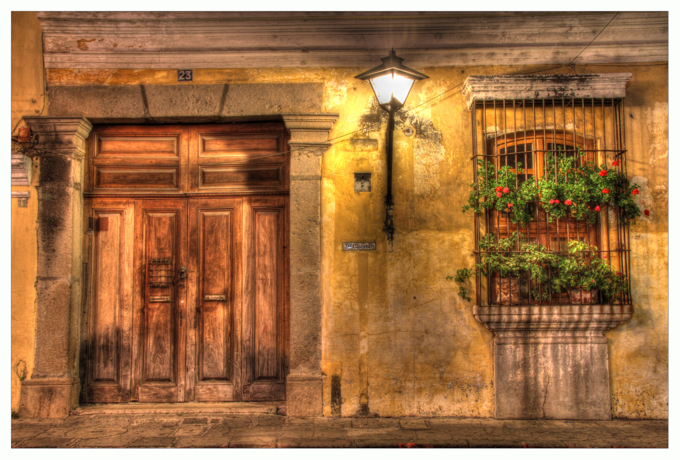 This is a nice addition to your series, where were you when I needed a good photographer in Antigua? Seriously, nice work… you take soulful pictures and your articles are a good read. Thank you for your kind words, but we wish the photos were better. We were in Antigua for three days total, and the weather was gorgeous for our first two days. We saved our main photo session for our final morning when, as luck would have it, the skies completely clouded over. We need to make a return trip and keep a better eye on the weather! I didn’t notice anything lacking. In the case of most artists, the perfect is the enemy of the good! There is always something more that you can capture, but you captured the essence of the place and aspects beyond what the eye of most people can see. Fantastic shots – especially the lighting on the colonnade on the main plaza. Beautiful summary as always – keep them coming! The photo of the colonnade was one of our first attempts at HDR photography, and, although we are sure experienced HDR photographers would find it full of flaws, it was fun for us to play around with this type of image making. We should give it a try when we are visiting you next–San Francisco is full of excellent HDR subjects. Thank you for reading! I love the picture of the colonnade, and the coffee plantation sounds incredible. I am glad you guys had a great time on your trip and got to come home to Moose. He is awesome! Thanks, Andy. We had a really nice time in Guatemala. It would be great to go back again some day! Moose appreciates the shout out! What fantastic pictures and videos of a great trip! I finally had a chance to look at all of the posts, such a cool adventure. You two really are amazing, and how fun that in the midst of it all you caught our Wildcats bowl win 🙂 That video of Moose is hysterical – going to have to remember that trick! Thanks for reading, Stephanie. Watching the Cats win their first bowl after so many close losses was a definite thrill. I wonder if Willy the Wildcat likes being vacuumed, too…what do you think? We hope all is well with you! Stunning photos by a talented team which includes the star – the 15-lb. cat Moose. Carry on.